North Sanpete varsity running back Maison Burgess breaks away from the pack with the ball during the Hawks’ victory over Manti on Friday. MANTI—The North Sanpete Hawks got sweet revenge last week when they beat the Manti Templars, 28-7, on the Templars’ home field. Last season, the Templars scraped together a close 29-28 win against the Hawks. 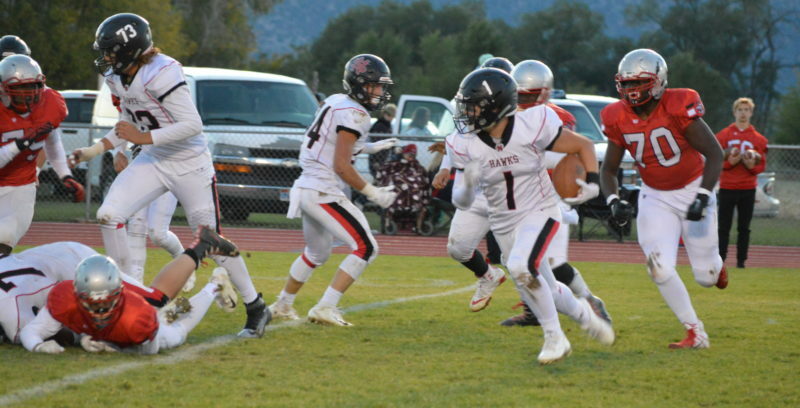 The Hawks broadened that narrow margin during their rematch last week, thanks to an effective offensive, combined with the same consistent defense the North Sanpete athletes have exhibited so far this season. “That was the formula for the kind of football we want to play,” said North Sanpete coach Rhett Bird. “I thought we played really well the first half offensively and defensively. Unlike Manti’s battle with Juan Diego the previous week, the Hawks wasted no time accumulating touchdowns in the first quarter. Two 4-yard runs gave the Hawks a 14-0 lead in the first quarter; while the Hawks’ defense didn’t give up a point. 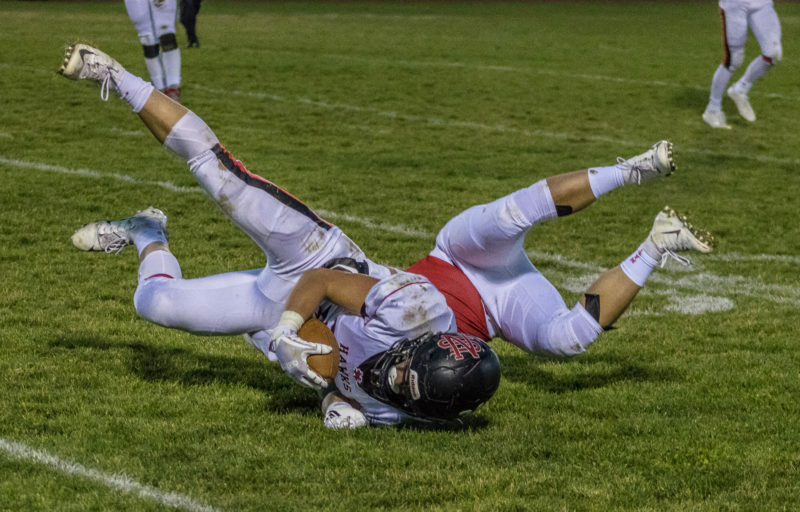 Manti and North Sanpete players collide in a nosedive during a play that ended like many on Friday, with smart defense on both sides preventing either team from reaching a high score. Ultimately, North Sanpete prevailed, 28-7. Hawk quarterback Spencer Clawson was responsible for the first touchdown, and his teammate, fullback Brock Justesen handled the other. Devin Palmer followed each touchdown up with a successful kick. In the second quarter, Clawson sent a 40-yard pass to teammate Ethan Bowles for a touchdown, and Palmer’s golden toe put another through the goalposts right after. Just before the end of the first half, Manti made it’s only touchdown of the game when Spencer Cox ran for 16 yards. The final half of the game was less eventful, with the Hawks making a final touchdown in the third quarter, and neither team scoring the in the fourth. Manti, now 4-4, faces Richfield in an away game Friday. Richfield has yet to win a single region game this season. 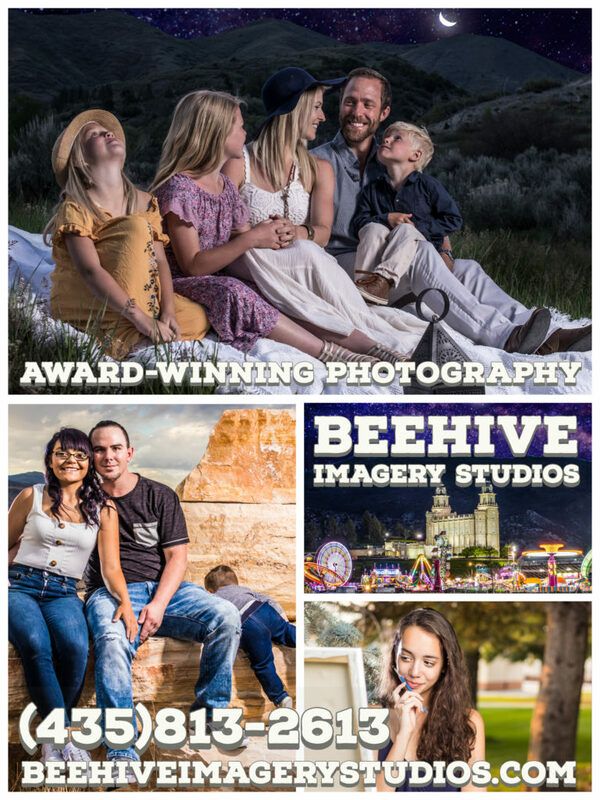 The very same night, the Hawks will take on Juab, who have been on a three-game losing streak.